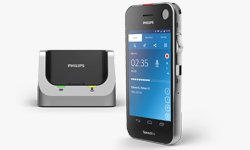 This starter kit includes both the Philips PSP1200 and the Philips LFH7277 Transcription Kit. This allows for full secure dictation workflow from Author to Typist. This also allows for an Author to be entirely mobile - sending dictation directly from the device using either email or optional SpeechLive service (Ideal if typist require to be mobile also). 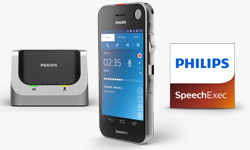 We guarantee that you won't find this SpeechAir Kit anywhere else at this competitive price - and whats more, we are giving away a One-Year SpeechLive package for two users for just £99.00 when you purchase this Philips SpeechAir Kit Today! Save time by transferring your finished recordings wirelessly to your transcription staff and directly access patient or client data. Use Wi-Fi for VoIP calls and access your emails and calendar. Use Bluetooth to send and receive data or to connect external speakers. 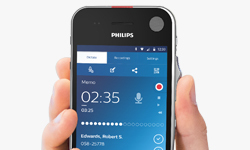 Optional remote administration using Philips Remote Device Management software* allowsIT administrators to manage, configure andupdate dictation hardware centrally, savingvaluable time and resources. Recordings are encrypted in real time using the Advanced Encryption Standard (AES) 256bit, which has been approved in the USA for the most highly classified government information. A PIN code protects the device against unauthorized use. Settings can be locked, for instance connection to Wi-Fi networks can be restricted.